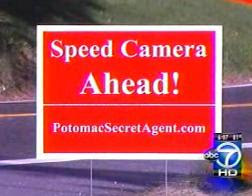 Kudos to the individual who has posted signs warning drivers ahead of speed cameras in the Potomac Region. According to a report on WJLA news, the signs have been posted by an anonymous Potomac resident, identified as only as the "Potomac Secret Agent" who is frustrate with the increasing automated traffic enforcement in the area. 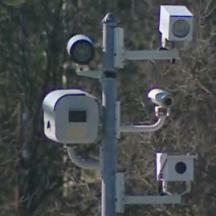 The speed cameras in the Potomac region have been criticized by some area residents because they were placed and extremely short distance after a 10mph drop in the speed limit, almost as close as some other cameras in Darnestown. The Montgomery County Government is in the process of doubling its number of fixed-pole cameras from 30 to 60 in order to meet a $15.7 million revenue goal set in its FY10 budget. The signs refer to a real-estate based website which promotes the petition for referendum against the recently passed statewide speed camera law. If other individuals are similarly frustrated by the cameras and do not wish to see them spread to every road in the state, they can protest by collecting signatures for that petition.